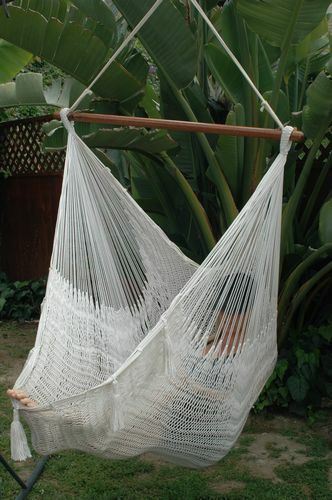 This is the ultimate in hammock chairs. 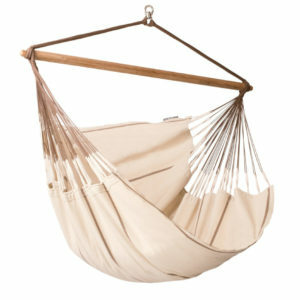 For years we have had customers ask us for a woven hammock chair that has more material and a fancier look. 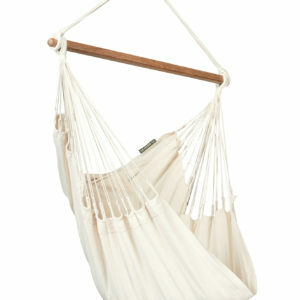 After years of design work, we have finally created the ultimate in hammock chairs. 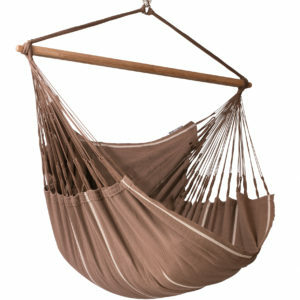 We use twice as much mateiral as in our original hammock chair for our Deluxe chair. Not only that, it is made out of 100% cotton for the softest feel on your skin as well as supreme durability in the sun. We use a special double weave for this chair for added support and smoothness on the skin. More material with a closer weave equals supreme comfort. To create a fancier look, we added tassles to the front edge of the chair. Like all of our chairs, the Deluxe chair is easy to move, so we suggest multiple locations to ensure more frequent use. You can put hooks in the ceiling of bedrooms, family rooms and offices and more hooks outside from patio covers, gazebos and awnings and move the chairs wherever you feel like hanging out. 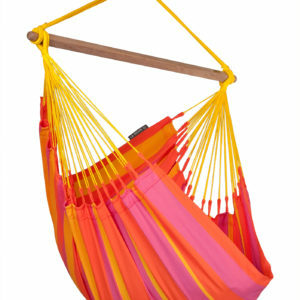 The hammock chair creates the perfect escape. Bar Length – 3 Ft.